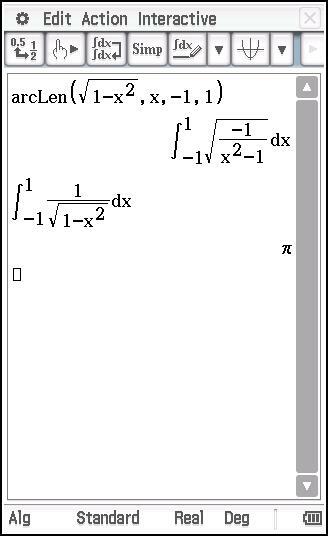 The calculator uses the integration of SQRT(1/(1-X*X)) to calculate arcLen( SQRT(1-X*X)...) . The problem seem to be the integration limits -1 and 1. The expression 1/(1-X*X) is not defined for these values. F. i. if you use -0.999... and 0.999... as integration limits, the calculation is at least possible. SimonLothar wrote: The calculator uses the integration of SQRT(1/(1-X*X)) to calculate arcLen( SQRT(1-X*X)...) . Thank you for the workaround but I wonder why ClassPad can't calculate the exact result? So I think it's a bug in the ClassPad CAS and it would be great to get it fixed. Do you know how to report this to Casio? Yes, that is a bug indeed. They should correct it. A new OS version has been released. Is it only me or the integrals calculation is still very poor? For instance, if I try to evaluate (250/(2*pi)) times the integral from pi/2 up to pi of sin(2*pi*50*t) dt, it tales like 3 of 4 minutes to return a result! However, if I use 3.14 as an approximation for 'pi', the result is returned in like 6 or 7 seconds! PS: I have just installed the latest OS update! I have told this in previous versions and I also tried to contact portuguese supporter and also some support email from asia that I can't remember, but never seen any improvements neither got any reply from that emai!